Senegal's Salif Sane and Diafra Sakho after the 1-0 defeat to Colombia in their final Group H game on Thursday. Senegal's football federation (FSF) has asked Fifa to revise its new fair play ruling which resulted in the Africans' World Cup exit on Thursday. After Japan and Senegal finished level on points, goals scored and goal difference, the Africans became the first team to exit a World Cup because of their disciplinary record. Knowing the situation, Japan - for whom extra bookings could have resulted in elimination - played out the final 10 minutes of their game against Poland at walking pace despite trailing 1-0. "In future, Fifa should penalise a team that plays that way," said an FSF official. "Fifa has adopted a new system but does the fair play rule solve all the problems? After the game, nothing happened to either Japan or Poland. "There should be some means of penalising players, coaches or teams for such an attitude," the official told BBC Sport. The FSF says it is not seeking World Cup reinstatement but merely hopes that teams will not suffer in the same way as the 2002 World Cup quarter-finalists did when exiting the competition in Samara. 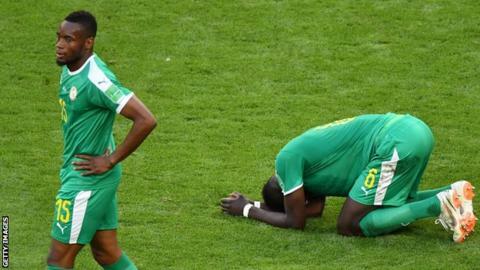 The Senegalese sent two letters to Fifa on Friday, one of which addressed the fair play criteria while the other complained about the standard of officiating in Senegal's 1-0 defeat by Colombia. "The federation believes that Japan literally refused to play when it learned that Colombia had just scored a goal against Senegal, a refusal to play that suited Japan but which is contrary to the principles governing football," the letter stated. "The federation is all the more shocked that the Japan coach did not deny the facts. In the post-match press conference, the latter even confirmed he had made the decision to manipulate the result by keeping the score at 1-0." Poland's Jan Bednarek celebrates after scoring against Japan in the group H match on Thursday. Japan took the runners-up spot in Group H because the Asian side received four yellow cards in contrast to Senegal's six. If teams finish level on points after the three group games, positions are determined by goal difference, then goals scored, head-to-head record and fair play record. If they still cannot be separated, the position in the group is decided by the drawing of lots - a scenario Fifa says it specifically tried to avoid when introducing the new ruling in 2015. "This is the first time we've used it at a World Cup, so we will review it. But, as things stand, we do not see any need to change it," Fifa director of competitions Colin Smith said on Friday. The crowd in Volgograd booed and whistled as both the Japanese, fearing further bookings or conceding a goal that would have tipped qualification Senegal's way, and the Poles, content to win their first game in Russia, made no effort to score. Japan coach Akira Nishino said "it was a very tough decision" to adopt the tactics, while the end to the match was described by commentators as "embarrassing" and "an absolute farce". The scenes were reminiscent of West Germany's infamous 1-0 win over Austria in 1982, which became known as the 'Disgrace of Gijon', after both teams adopted similar tactics to engineer Algeria's World Cup elimination. Following that decision, the group stages were changed so that matches finished at the same time. Fifa has confirmed receipt of the letters from the FSF but refused to comment. What went wrong for Africa at the World Cup? Read more on World Cup 2018: What went wrong for African teams in Russia?